Worthington, Ohio, Friday April 24th, 2009. Never too late, you are right. These clouds are dramatic. Thank you for sharing!!! This week, the Skywatch photos are relaxing. ooh, so dramatic and there is a brilliant sene of motion. I´ve seen that kind of clouds couple of times and it´s a real treat. 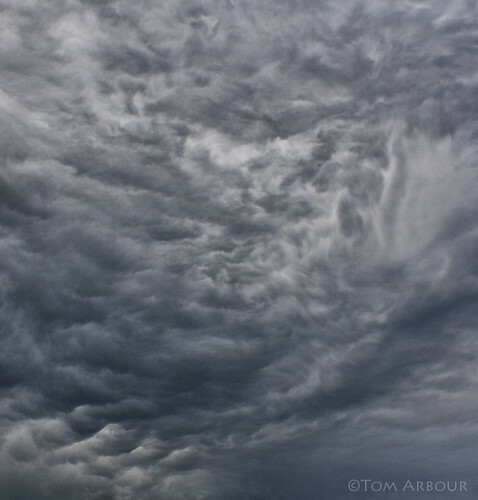 Tom: What a neat capture of a troubled sky. I bet high winds followed this sky. Wow...it looks like you are right up there in the middle of that cloud. Great shot! Stunning. It looks like a painting... God's painting. Now this is something I haven't quite seen! Honestly..what a terrific shot! So intense..what drama! Nice capture! !